We’re on a roll! 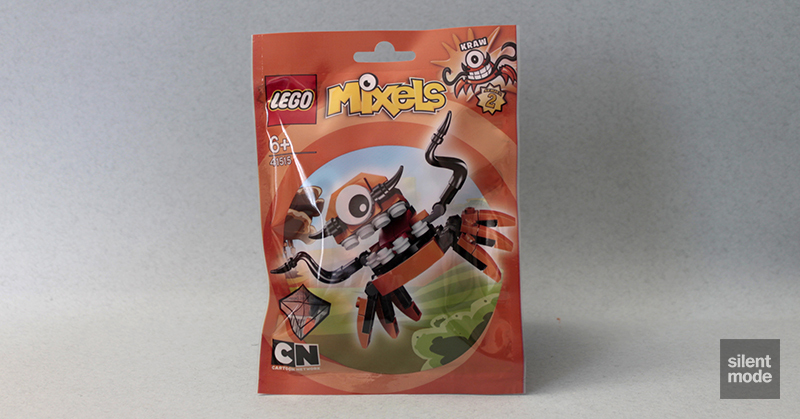 Here we are again with yet another review of Mixels Series 2, and for our last run this time around we’re paying a visit to the Flexers: orange Mixels resembling creatures underwater, perhaps even deep-sea creatures. First up is Kraw, who looks a lot like a crab that’s had its pincers removed. The moustache next to its singular eye suggests it talks with a French accent – which would make sense, given how they like their seafood. 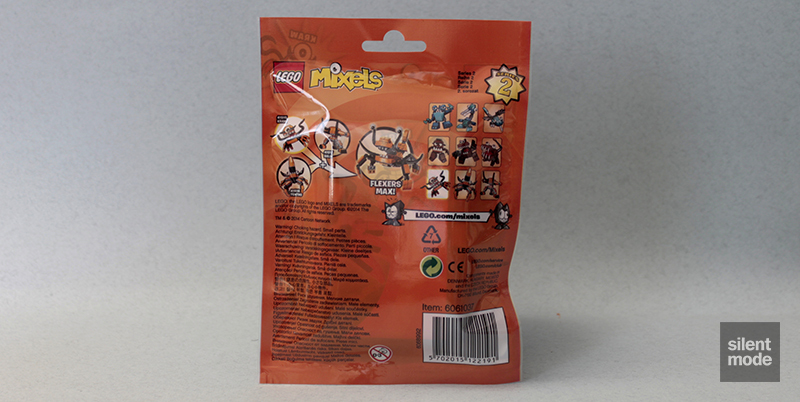 For completion here’s the back of the packaging, which is similar for all the Mixels in this tribe. Hmmm… Partly due to Orange being the only other colour used in this tribe (along with Red, Black, White and the Stone Greys), the line up of parts doesn’t immediately appear to be interesting… but we do have a small selection of “baby bows”, including some in Orange, to play with. We also get eight 1×1 Orange plates, found in only a handful of other sets, including 7642 Garage (10) and 10233 Horizon Express (16). A part common to all of the Flexers Mixels is 11090 Bar Holder with Clip: a part that was introduced last year and has proven invaluable in advanced MOC building. These appear in Black, though we only get one in this set. You’ll have noticed that Kraw doesn’t come with any of the new joint parts: instead it has to make do with stepped hinge plates. It kinda dampens the experience, knowing how stiff the joints are going to be as a result. Disappointments aside, we continue building the body to give Kraw an obvious tongue and a set of thick but not quite menacing teeth. 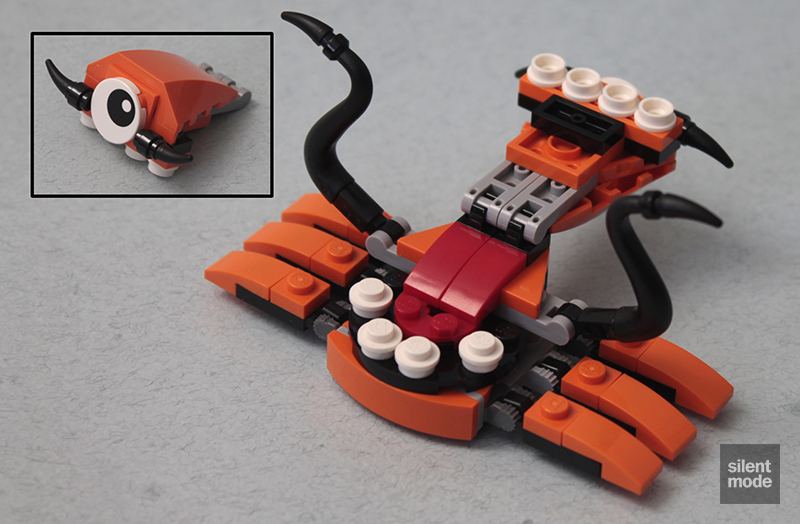 Kraw’s six legs are identical and very simple builds using the Orange baby bows and 1×1 plates. 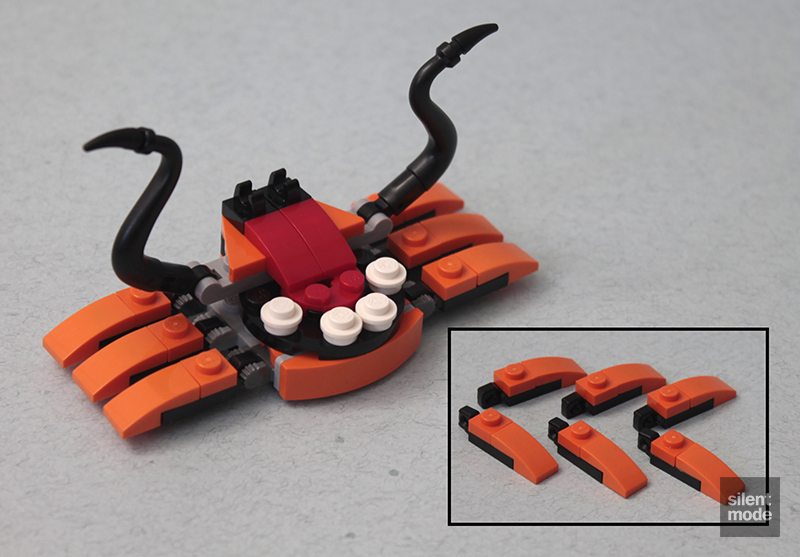 It also gets a pair of Black tentacles, constructed with the help of part 11090 and “elephant trunk” tail parts. Gobba isn’t going to be happy at all, because Kraw has just demonstrated it has an even bigger mouth. The use of smooth hinge plates means it can bend all the way backwards. Here’s Kraw: the Mixel voted most likely to have been mistaken for a Disney character. It fancies itself as a connoisseur of fine wines and cuisine, and may even claim to have trained under the best chefs in Europe. KRAW might be short but the leader of the orange tribe of Flexers, which lives in the remote Rubberlands, is one confident character. Claiming to be the smartest Mixel in the world, KRAW loves to challenge anyone to a quiz, but this round-bodied Flexer’s main strength is to make like a bouncy, rubber super ball to evade or smash Nixels. So it turns out: even though these Mixels resemble deep-sea creatures, their main ability is stretching and bouncing. The clue is in the tribe’s name! Three leftovers this time, and though I’m very keen on the 1×1 Orange plate, some of you may be eyeing that Black horn piece. I think this Mixel is all right. Even though the legs make use of the stepped hinge plates instead of smooth ones (or even the new joint parts), the way the Mixel was constructed means it’s still posable without things coming to pieces. Above all else Kraw has character, and the wide opening and closing mouth adds to the appeal. I’m giving this one 6.4/10.